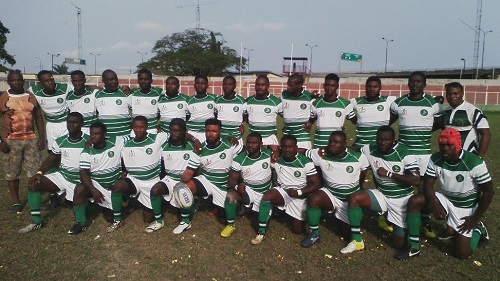 Cowrie Rugby Football club of Lagos, Saturday at the Onikan Stadium retained its status as the South West League Champions. The one day tournament sponsored by CMB Investment and Maintainance Company and organised by the Nigeria Rugby Football Federation saw action in the Division 1 between Lagos RFC and Royal Stallions RFC, Ilorin. It was the Lagos RFC that triumphed 6-5, thus qualifying to the premier league. And in the second game of the day, Police RFC decimated Gosar RFC 64 - 0 in a largely one sided affair. The final game was the mouth watering match between defending champions Cowrie RFC and hard fighting Racing RFC. It was indeed, a glowing testimony of the fast rising status of the gentleman's game in Nigeria. What with end to end actions that kept the impressive crowd at the edges of their seats. And at the end of the pulsating encounter, Cowrie Rfc extended its unbeaten run with a 24 - 13 victory to lift the coveted trophy. Monday Alex of Racing RFC, went home with double honours as he was declared the MVP and Highest Try Point Scorer of the tournament. The MVP award for the final game went to Alfred Oche of Cowrie RFC. Even as Lagos RFC was adjudged to have qualified for the premier division. Speaking at the end of the proceedings, the Managing Director /CEO of CMB Investment and Maintainance Company, Mr Kelechi Mbagwu expressed delight over the success of the tournament. He also added that he was particularly impressed by the standard of play exhibited by the teams. He went ahead to restate his unalloyed passion and commitment to the growth of rugby in Nigeria. "I am obviously impressed by the standard of play by the teams and it shows that the game is growing fast," he enthused. "And without a doubt, it would only spur me to continue to support the sport as long as God also continue to bless me with the strength and financial wherewithal," Mbagwu added. On his part, the Vice President of the Nigeria Rugby Football Federation, Olatunji Fasimoye, enthused confidently that the tournament would go ahead to boost the morale of the national team as it prepares to take part in the World Cup qualifiers coming up Morocco, next month. "Thank God for this tournament. It would surely ensure that the Black Stallions are in the right physical and technical conditions to confront all oppositions at the qualifying games in Morocco, "he said. Continuing, Fasimoye who also doubles as the technical director of the NRFF, poured encomiuns on the sponsors of the tournament for its unflinching love and passion for the sport. Even as he admonished the government, corporate organisations and well placed individuals to rally in support of the federation.